Executive Staffing to provide legal counsel in the areas of intellectual property strategy and management for growth technology, manufacturing, and food & beverage businesses. 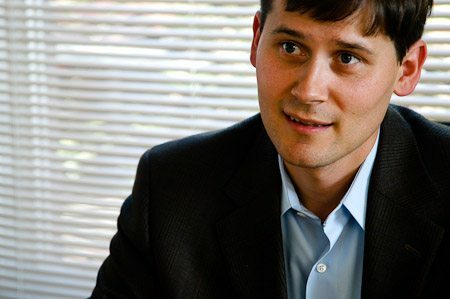 3-Blazes founder and CEO, Devin Morgan, is an experienced intellectual property attorney. He affiliated with Hoffman Warnick in 2015 to provide part-time Special Counsel to select clients based on his legal expertise. Hoffman Warnick is an established boutique law firm headquartered in Albany, NY, specializing in intellectual property, including patent and trademark prosecution, counseling, and transactions. They have the staff and business systems to do intellectual property well, representing intellectual property power houses like IBM, GE, and Global Foundries. This provides Devin’s legal clients with excellent service and support, while clearly separating his legal services (which can only be purchased through Hoffman Warnick) from his venture development and innovation training, consulting, and mentoring available through 3-Blazes. If you are interested in legal services, such as trademark or patent applications, licensing transactions, or business startup, please contact Hoffman Warnick directly. 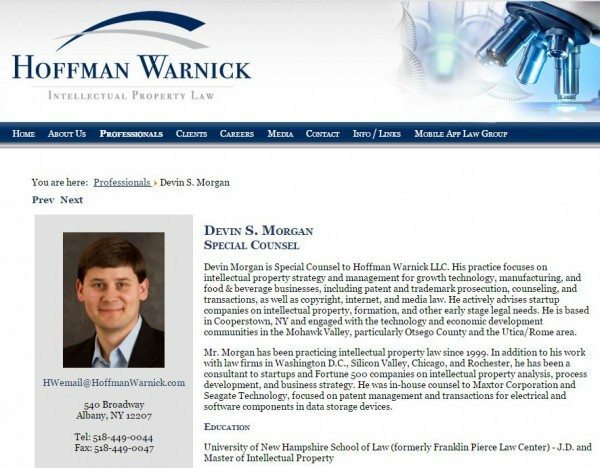 You can learn more about Devin’s role and how he helps his legal clients on his professional profile: Devin S. Morgan Hoffman Warnick. This project description may contain ATTORNEY ADVERTISING. Nothing on this website or other 3-Blazes related content should be regarded as sponsored or in any way affiliated with Hoffman Warnick LLC. 3-Blazes is solely responsible for the content and any views or opinions expressed therein. So, you may ask, how does this relate to 3-Blazes mission to help small businesses use innovative products, people, and systems to grow great businesses that drive economic growth? Intellectual property is at the heart of modern businesses of all size and is one of the natural byproducts of innovation. Legal protection of intellectual property is often one of a growing business’ first forays into systematizing what the know and do, so is an excellent starting point for learning about systematic business innovation. It’s also where Devin got his start in business innovation and he still finds Central New York and small businesses generally to be a under served market worth supporting with valuable and approachable IP know-how. For 3-Blazes, Devin’s connection to Hoffman Warnick provides a great path for getting high-quality legal support for ventures we work on or with.